~ Calming the mind and clearing of sensory overload from television and computers which clutter our consciousness and suppress our natural creativity. ~ Purification of our energy fields. ~ Conscious, intentional visioning of new potentials for ourselves and our world. Sound creates a bridge that reaches the Highest Realms. The joyful, transformative power of sound, made with intention, offers a natural way of shifting our frequency to the ever-expanding energies of Creation that are an inherent part of us. This higher creational work requires a balance of both silence and sound, for it is within the Silence that the Great Sound is heard. We live in a Harmonic Universe. Not only is our world comprised of sound, even the vacuum of space is full of sound which exists as electromagnetic vibrations: the solar winds interacting with the planets, the droning of pulsating stars. Every dimension of existence is an interplay of the frequencies of sound, light and geometry. Frequency or vibration are the keys which open the gates of higher consciousness. The shifts that I have experienced in my own consciousness and the breakthroughs that have occurred as a result of my continuing explorations with sound, have lit an inextinguishable fire within. In fact sound is fiery in nature. When one begins to work with the sacred science of sound, a powerful force is invoked. As we elevate our vibration though sound, the spiritual fire in our body rises. This fiery stimulation loosens and dislodges energies of a denser nature, causing them to surface. So in conjunction with this work, a personal willingness to release the old energies that will emerge is essential. The work of inner purification is ongoing and of outmost importance as we continue to refine our energies and integrate soul consciousness into our daily life. Sound has opened gateways within me that had previously remained dormant. It has provided me with the means for accessing higher octaves of consciousness. When we travel the sound current, we are not travelling anywhere outside ourself – we are travelling within, as the body is the gateway to All That Is. Sound offers us a key to the kingdoms within. It assists us in restoring inner harmony and reconnecting with our divine self. When I first began working with sound as a therapeutic tool for healing, I was struck by what an incredibly efficient tool it was for moving blocked or stagnant energy within the body. The beauty of sound and its wide appeal lies in part with the fact that it is based on physical laws of the universe and therefore it doesn’t require a giant leap of consciousness for people to experience and accept its benefits. A demonstration I love to give which powerfully displays sound’s ability to move matter, is the making of structured water with a crystal singing bowl. This is the simple act of filling a crystal bowl about half full with water and proceeding to play the outer rim of the bowl with a rubber mallet. At first a herringbone pattern appears on the water’s surface, then effervescent bubbles begin to well up and finally, as a certain speed and pressure with the mallet is reached, the water begins to dance up about six to twelve inches out of the bowl in a cascading fountain, forming a beautiful symmetrical pattern. This provides a very visual way of understanding the power of sound to alter physical form. Our bodies are composed of approximately 80% water, making them perfect conduits for sound, as sound waves travel close to five times faster through water than air. In the same way that the sound arranges the water in the crystal bowl, so can it re-organize the water and crystalline components of the tissue, cells, and organs of our body into a harmonious tuned formation. This “inner body sound massage” functions like a divine tuning fork, bringing us back into a state of harmony and attunement. My book Travelling The Sacred Sound Current offers sound tools for the reharmonization of ourselves and our earth. It is for anyone drawn to exploring sound as a path for awakening, self-healing and accessing higher levels of consciousness. Whether their interest in sound is primarily therapeutic, or whether they have a more spiritual focus, my intention is to provide a solid, ground level foundation of knowledge as well as to inspire people to further study and exploration of the magical work of the soul with sound. My research for the book has been a combination of my own experiential work with sound as well as a gathering of ancient wisdom teachings and spiritual sound practices from many masters of sound and various cultures throughout the ages. These ancient “sciences of sound” contain vital keys for the restoration of harmony for humankind and our continued evolution of consciousness. In a sense we are simply relearning what the ancients knew; that sound is a fundamental means of re-connecting with the Divine and it offers us a means for transcendent experience, a way to access realms of consciousness beyond that of our 3rd dimensional experience. Thus sound becomes our ticket for higher spiritual travel. Why does sound affect us so profoundly? Sound evokes a remembering within, it speaks to our soul in a way that nothing else does. It is intimate, it is visceral, it elicits feelings. The secret to its power is its ability to penetrate through all of our bodies – physical, mental, emotional, spiritual – where it touches our innermost being. Before, during and after our physical experience of life here on earth, our soul exists as sound and light. Pure sounds – like those heard in nature - remind us of our true origin. “All things being derived from and formed of vibrations have sound hidden within them, and each atom in the Universe confesses by its tone, ‘My sole origin is sound’.” (Sufi Master Hazrat Inayat Khan) Nature contains the language of pure vibration, it contains “sound codes” that stir our awakening consciousness. The sound of the wind blowing through the trees creates natural harmonics, the soft rhythm of falling rain drops, the continual pulse of ocean waves on the shore, the sound codings contained in birdsong and cricket song; this is the original language and by simply allowing ourselves the time and space to become quiet and listen, we begin to awaken to a primal language that our soul instinctively understands on a deep level. As Light and Sound Master, Tulsi Sahib wrote, “Listen, a Sound is coming from the Eternal Abode to call you back”. The nature of sound is a vibratory wave that penetrates deep into the energy field of the listener. Of course the vibration carried by a particular piece of music depends on the intention (or lack of) of the musician and singer. If we realized just how great an influence sound exerts on our subtle bodies, we would be much more selective in terms of what we allowed to come into our field. Music created from varying levels of consciousness will exert different effects on the listener. Think of a song recorded by a rock band high on drugs. What was the state of consciousness of the singer? What type of energy pollution might you be bombarded with as you listen to this music? This example represents one end of the spectrum, while music created with a sacred intention is at the opposite end. The chants and mantras I sing on Travelling the Sacred Sound Current were recorded in my healing sanctuary set in a natural wilderness location, far removed from the chaotic energies of a city. They were sung in sacred ceremony with very specific healing intentions of the chants transmitted through the sound. The Gayatri mantra for instance was recorded at the exact time of the summer solstice when the solar power of the sun is at its peak for the year, with the full light of the sun bathing my face I as sung it. This is an ancient Sanskrit prayer and sound formula evoking the Divine Sun of Life to enfold us with universal protection, purification, and enlightenment. The opening harmonies to this chant were an invocation to the great Seraphim who are the Carriers of the Holy Fire and assist one’s travel to the higher realms. The mantra was accompanied by the pure tones of a crystal singing bowl. When people listen to this music, they describe that they feel transported to a higher state of consciousness because the vibration of the chant creates a direct channel of communication between the chanter, the listener of the chant and the energies invoked through the chant. Another beautiful healing chant on the CD is Om Mani Padme Hum which embodies a tremendous energy field of compassion and love. Prior to recording this song with my son Matt who is a master drummer, we linked our intention and went into meditation. We connected with a vision of the Mother of the World, sitting high on a Himalayan mountaintop by an ancient temple, singing her prayers from her heart of compassion to the world. With this focus, the music, rhythm and melody for the chant emerged. The CD also provides a powerful crystal bowl meditation and offers a sampling of the other-wordly sounds of ancient Peruvian whistling vessels which are phenomenal psycho-acoustic tools. For those wishing to experience a "shift in consciousness", the CD offers a treasure of sacred intentional sound with which listeners can travel the sound current of spiritual healing. Most importantly, I hope people will be inspired to sing along with the chants so that they can experience first-hand, the power of their own self-generated sound. When enough of us are singing from our hearts with the voice of our Soul, a new song will unfold in our world thirsting for harmony. 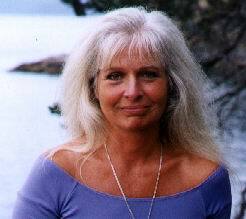 Deborah Van Dyke is the author and artist of the newly released book, TRAVELLING THE SACRED SOUND CURRENT: Keys for Conscious Evolution and the companion CD, TRAVELLING THE SACRED SOUND CURRENT: Divine Chants & Sacred Tones For Healing & Meditation. She is also the creator of CRYSTAL VOICES and SOUNDS OF LIGHT crystal bowl meditation CDs, definitive healing tools in the field of therapeutic sound. She holds ceremonial concerts of Sound and Light at the Vancouver Planetarium Star Dome and teaches Sacred Sound Intensives. For more information you can call toll free 1-877-777-6863, or visit her website at www.soundcurrent.net Her book and CDs are also available at Amazon.com, Borders stores, or your local bookstore.